I am going to attempt to answer the above question. In order to do so, I will split this report into the following six sections. 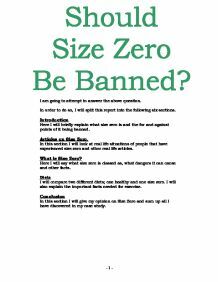 Introduction Here I will briefly explain what size zero is and the for and against points of it being banned. Articles on Size Zero. In this section I will look at real life situations of people that have experienced size zero and other real life articles. What is Size Zero? Here I will say what size zero is classed as, what dangers it can cause and other facts. Diets I will compare two different diets; one healthy and one size zero. I will also explain the important facts needed for exercise. Conclusion In this section I will give my opinion on Size Zero and sum up all I have discovered in my case study. Sections. Page 1 Contents Page Page 2 Introduction Page 3 Articles on Size Zero Page 4 What is Size Zero? Page 8 Diets Page 11 Conclusion Page 14 Size zero is a much debated subject in the press and in the latest fashions. There have been many arguments about this case and whether to ban it or not. Some of the reasons people have wished to ban size zero is because it can become very dangerous. A lot of celebrities and young girls have seen the size zero image and think it's the right one for them. However, it is extremely dangerous and can even result in death. Some people say that it is unfair to ban size zero because the naturally thin models that are already size zero will get to miss out on taking part in something they enjoy and are talented in. So now I will attempt to answer my question: Should size zero be banned? Here is an article on Size zero from the sun newspaper. I researched it from the internet by browsing past articles from The Sun website. ...read more. Giorgio Armani, in London last week for a show for his Emporio Armani label, responded to a question from Reuters Television that he himself doesn't like women modelling his clothes to be too skinny. "Unfortunately, though, the stylists and also the media have interfered and they now want models that are incredibly thin."....... The governments imposing and considering bans all cited the possibility that teenage girls might become anorexic trying to emulate the skinny models. But we don't always practise what we preach, it seems: A recent study by the University of Bath found that more than two-thirds (67 per cent) of women surveyed preferred pictures of thin models to those of a larger size, saying the thinner ones were elegant, more interesting and generally more likeable," according to Media Life magazine. However here is an against size zero models case. It explains how Milan went about enforcing their ban of models under the age of 16 going into fashions because it gives off a bad impression for everyone to be that size. This is from http://news.independent.co.uk/europe/article2081661.ece accessed on 21st of June 2007. Some of the most powerful figures in the fashion world have put their weight behind a campaign to banish dangerously thin models from the catwalk. Under the charter published yesterday, fashion chiefs will require models to show proof of their good health - or be barred from some of the world's most prestigious fashion events. Drawn up by a coalition of global fashion houses and the Italian government, the new voluntary code also bans the use of models aged under 16, saying that they risk "sending the wrong message to girls of the same age in the delicate pre-puberty stage". The campaign's signatories will pledge that they will include larger sizes in their latest collections in recognition of the "healthy, sunny, full-bodied Mediterranean beauty that Italy has historically contributed". As reported in The Independent on Sunday last week, the code - to be signed by leading fashion houses next week - ...read more. These set a really bad example to young women and men in some cases in the general public. This was proven in an above article given. The quote said "Experts say the craze is already in Britain." This quote from http://findarticles.com/p/articles/mi_qn4161/is_20060813/ai_n16651252 shows that this dangerous trend is already in this country. There was also another quote taken from the same source saying "Five years ago I would not have offered a size 0. But now there are some very, very thin people out there." The consequences of being size zero as stated up in my case study are loss of periods in girls, hair falling out, thinning of bones and dry skin. As well there is a chance of white blood cell count going down. However, these articles disagree with my opinion and there is a quote from "Not all models are Anorexic, sick and have body image problems." This quote is true and does explain that not all models are having eating disorders and damaging their body just to become size zero. Another quote taken from the same source is "There are a small percentage of women who are the size of the "ideal" catwalkers, naturally." This statement tells us that the people who are ideal sizes do exist and not all models diet to look a certain way and to become a model, some people have the natural look and talent. Although, I still believe that size zero models should still be banned because I feel even if it is natural it still promotes and unhealthy image for younger girls who may be larger then any of the models. People could say that my opinion is wrong because it stops models that are naturally skinny and talented from dong something that they love and enjoy doing, still how ever as I said before it does not promote a healthy image for teens today. By Katie Miles 10a ?? ?? ?? ?? - 1 - ...read more. This student written piece of work is one of many that can be found in our GCSE Food Technology section. They feel trapped in a cycle in bingeing and then punishing themselves, with no escape. Repeatedly taking laxatives and making themselves sick will damage their health. In females, periods may become irregular or stop altogether. Like anorexia, bulimia can be fatal. Contrary to popular belief, chocolate does not cause acne. In a 1970's study carried out at the University of Missouri, test subjects who believed their acne problems got worse within 36 hours of ingesting the "culprit" food were given the equivalent of 230g of chocolate and then observed every day for the week following. A healthy diet when Pregnant. Vitamin A Although liver and liver products, such as pat� and liver sausage, are good sources of iron, they can also contain very high concentrations of vitamin A. Too much, if taken in excess, can build up in the liver and cause serious harm to a growing baby. * From solid foods, especially fruits and vegetables. * As a by-product of chemical reactions within the body. The British Dietetic Association advises that the average adult should consume 2.5 litres of water per day. Of this, 1.8 litres - the equivalent of six to seven glasses of water per day - must be obtained directly from beverages. In addition, McDonald's uses vegetable oil French fries which enhances food quality. Also, in a McDonald's burger it covers a number of levels in the food pyramid. In Big Mac, it includes cheese, vegetables, bread and meat which give a balance diet to customers. An Observation of Gender Differences In Diets. was the gender of those being observed. The dependent variable (DV) was the healthiness of the food eaten, (determined by points on a marking scheme, 2points for unhealthy foods, 1 point for healthy foods). PARTICIPANTS Participants were selected using opportunity sampling. The sample consisted of 40 students (20 male, 20 female). Looking for expert help with your Design & Technology work?